Anyway, for her baby shower I wanted to do something simple, but fun. I grabbed 10 of my blue glitter polishes and decided to do an ombre blue glitter mani. Obviously, I opted for blue because she's having a boy. I swiped each polish on a piece of paper so I could figure out what order to put them in. I thought I got it right, but after all was said and done, I had a couple that were a little off. It was ok though because it wasn't all that bad. This is a little picture heavy so I'll get right to it! 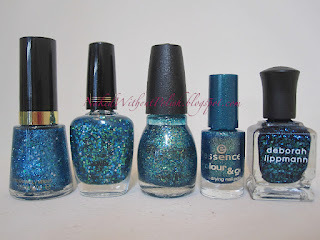 OPI - Last Friday Night, Kleancolor - Sparkle Emerald, Wet n Wild - Fast Dry - Blue Wants To Be A Millionaire, OPI - Gone Gonzo and Lacquistry - Undertow. The above polishes are on my left hand in order of pinky to thumb. This is 2 coats of OPI - Last Friday Night. Last Friday Night is a light blue jelly base with glass fleck glitter and small round blue, pink and silver holo glitter. It went on smooth, no pulling. Just the right amount of glitter in each coat. Not too little and not too much. Still some VNL, but it is what you would expect with this type of polish. 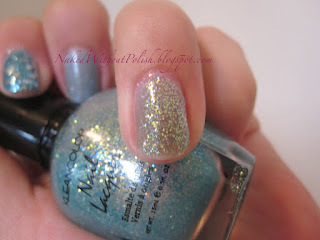 No disappointments, just a soft flirty pale blue glitter. Topped with 1 coat of Gelous and 1 coat of Seche Vite. No shrinkage at all. This is 3 coats of Kleancolor - Sparkle Emerald. 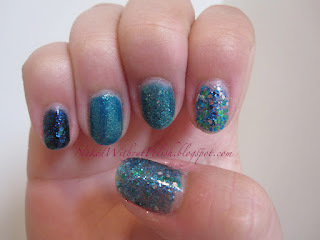 Sparkle Emerald is another pale blue jelly base fill with tiny light blue holo glitter. No pulling and no issues, it was lighter than I thought it would be. With 3 coats there was still VNL. Kind of expected, but I was kinda hoping it'd be otherwise. This is such a fun polish. Would definitely be a great layering glitter. I topped with 1 coat of Gelous and 1 coat of Seche Vite. This did end up having some shrinkage, so I would probably just leave it alone at Gelous next time. This is 2 coats of Wet n Wild - Fast Dry - Blue Wants To Be A Millionaire. Blue Wants To Be A Millionaire is another pale blue jelly. This one is just filled to the rim with silver and holo glass fleck glitter. I really love the Fast Dry formulas. They are smooth and go on like a dream. This is a great top coat type polish. Jazz up a nice creme with the glitter. This is topped off with 1 coat of Gelous and 1 coat of Seche Vite. No shrinkage or issues here. This is 2 coats of OPI - Gone Gonzo. Gone Gonzo is a clear base filled to the rim with bright blue glitter and medium sized silver hex glitter. I LOVE this polish!! I'm obsessed with this entire Muppet collection though. Each stroke of the brush is just full of glitter. It's topped with 1 coat of Gelous and 1 coat of Seche Vite. No shrinkage. This is 2 coats of Lacquistry - Undertow. Undertow is amazing! It's clear base filled with as much bright blue holo glitter as it can handle. It's an eye-catching sparkly gem of a polish. Topped with 1 coat of Gelous and 1 coat of Seche Vite. No shrinking. 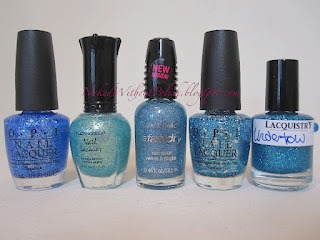 Revlon - Radiant, Milani - Jewel FX - Teal, SinfulColors - Nail Junkie, Essence - Color & Go - Choose Me! and Deborah Lippmann - Across the Universe. The polishes above are on my right hand in order of thumb to pinky. This is 2 coats of Revlon - Radiant. Radiant is a clear base filled with a vibrant bright blue glitter, silver and emerald green hex glitter. Yes, it's basically Gone Gonzo, but with emerald green hex glitter. Great formula, no issues with gloopiness (is that even a word?) or pulling. I honestly put it back the first time I saw it, because I thought it was just the same as Gone Gonzo, but the green really adds something to it. It's quite lovely! I topped it with 1 coat of Gelous and 1 coat of Seche Vite. There was some shrinkage, so I should have left it alone after topping it with Gelous. This is 2 coats of Milani - Jewel FX - Teal. Teal is a clear base filled with blue micro glitter, silver, green and teal blue medium sized hex glitter. This polish is so pretty, it reminds me of an ocean. I probably should have done 3 coats to attempt to get full coverage, but it's definitely better as a top coat instead of alone. With all the larger sized glitter it got to be a little bulky with only 2 coats. Topped it off with 1 coat of Gelous and 1 coat of Seche Vite and it was all evened out. This is 2 coats of SinfulColors - Nail Junkie. Nail Junkie is a teal jelly based polish filled with gold glass fleck, pink, gold, blue and teal small round holo glitter. A little pull happend when applying the 2nd coat, but no major issues. This polish had so much depth after the 2nd coat. Just gorgeous! Topped it off with 1 coat of Gelous and 1 coat of Seche Vite and it just sparkled! No shrinkage with this one. This is 2 coats of Essence - Color & Go - Choose Me!. Choose Me! is gorgeous! It's crazy to think that something so amazing can come from such a tiny bottle! It's a deep teal jelly base just filled with gold and teal glass fleck glitter. Such a flawless polish. No problems whatsoever, other than me needing to have 10 bottles of this. 1 tiny one just doesn't seem like enough. Topped with 1 coat of Gelous and 1 coat of Seche Vite. No shrinkage. This is 2 coats of Deborah Lippmann - Across the Universe. Across the Universe is a deep navy jelly base with pale blue micro glitter, emerald green and light blue medium sized hex glitter. There was still a very small amount of VNL after 2 coats, but I wouldn't have added a 3rd coat. I loved the layers that were already visible after 2. No issues once again. Topped off with 1 coat of Gelous and 1 coat of Seche Vite, there was no shrinkage with this polish either. I told you it was a simple mani, but I loved how playful it was. The polishes really complimented each other, and it was fun seeing the minor similarities in some of them that I didn't notice before. I thought it was a great way of celebrating a baby boy without going overboard with trying to do nail art. 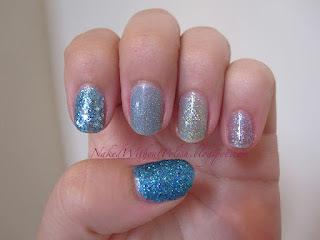 What are your thoughts on this glitter "ombre"mani? NOTD - Ready For Fall!